↵a Categories with discordant effects on systolic BP (SBP) and albuminuria are in boldface type. ↵a Hazard ratio (HR) was obtained using multivariate Cox model with age, gender, race, BMI, smoking, previous antihypertensive therapies, duration of hypertension, cardiovascular disease history, serum creatinine, serum albumin, hemoglobin, total cholesterol, triglycerides, glucose, SBP, DBP, and albuminuria at baseline as covariates (backward selection). 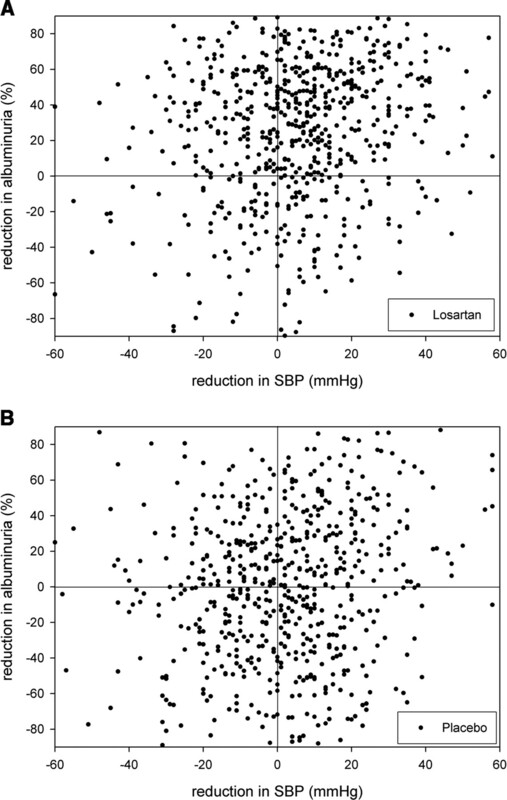 Indicators for reductions in SBP or albuminuria as well as baseline serum creatinine, serum albumin, hemoglobin, and albuminuria were forced into the model. Analysis adjusted for treatment group as strata. CI, confidence interval; K (Rate), no. of patients with ESRD (no. of ESRD per 1000 patient-years of follow-up); N, no. of patients with both SBP and albuminuria at baseline and month 6 prior to ESRD.